Every weekend wine event and dressage demonstration seems to be drawing a bigger crowd of visitors who come to Quailhurst to enjoy our wines and beautiful horses. Fall was definitely in the air this weekend, with the weather bringing plenty of both rain showers and sunshine. Deborah and working student Emily Anderson moved their demonstration rides to the indoor arena, where crowds gathered in the viewing room, wine in hand, to watch the riding and teaching. Our events always draw our long time friends and wine club members, as well as many new visitors, who all agree that the equestrian atmosphere of a working horse farm provides a very unique wine tasting experience. 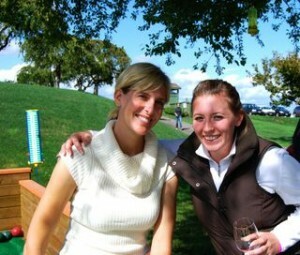 The Quailhurst Pinot Noir wines are named after horses from the farm, and this event featured our 2007 Abercrombie Reserve. We’re happy to report that, much like its namesake horse, four year old Abercrombie (aka “Fitch”), the wine is maturing very nicely. As usual, this weekend’s visitors spent hours at our event, walking through the stables, making new friends on the bocce ball court, playing on the giant outdoor chess board, and visiting with new foals Elliott and Edmonde. Over Labor Day, visitors also joined in celebrating two birthdays, including an eighty year old woman who delightfully posed with our horse, Roderick, for her birthday photo. It is truly a gift for us to see so many people of all ages enjoy the fruits of our labor here at Quailhurst. We hope you will join us at our next wine event in November.